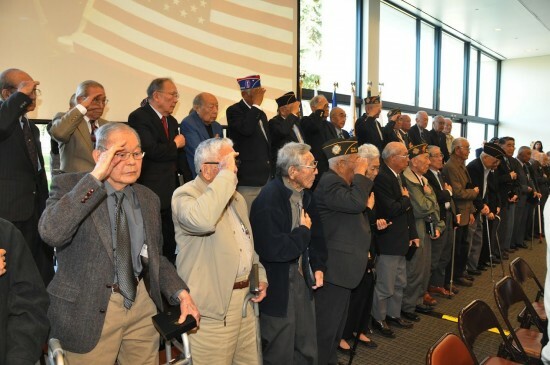 CLOVIS, Calif. — Nisei soldiers who served during World War II were honored during the Congressional Gold Medal ceremony for Central California, held Feb. 19, 2012 at the Clovis Veterans Memorial Building with 732 people in attendance. The Congressional Gold Medal was awarded to the 100th Infantry Battalion, 442nd Regimental Combat Team, and Military Intelligence Service at a U.S. Capitol ceremony last November. Japanese American groups across the country are holding regional events for those who were unable to travel to Washington, D.C. The veterans are given a standing ovation. JACL Central California District Governor Marcia Chung is front and center; to the right is JACL National President David Kawamoto. 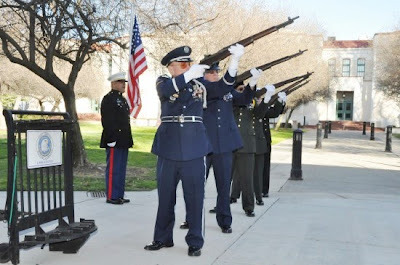 Members of the Joint Services Honor Command give a 21-gun salute. Bronze replicas of the medal, created by the U.S. Mint, were presented to 46 Nisei veterans and surviving spouses of 59 deceased veterans. The names of those killed in action were read, followed by a 21-gun salute, flag presentation and the playing of “Taps.” The Joint Services Honor Command, composed of former members of all services of the Armed Forces, participated in the ceremony. A total of 473 known Nisei veterans, living and deceased, were honored by name and service unit on six pages in the program booklet. Distinguished American Awards for public service were presented to Rep. Adam Schiff (D-Pasadena) and Sen. Barbara Boxer (D-Calif.), who introduced the Congressional Gold Medal legislation that was signed by President Obama in 2010. Neither honoree was able to attend, but the audience saw video messages from both, as well as from Obama. The sold-out luncheon also marked the 70th anniversary of Executive Order 9066, which authorized the removal and incarceration of all Japanese Americans living on the West Coast. CBS 47 sports anchor George Takata served as emcee. 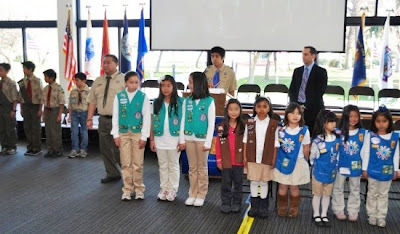 The presentation of colors was conducted by Boy Scout Troop 199 and Girl Scout Troop 305, and the invocation by Rev. Kurt Rye of Fresno Buddhist Church. Boy Scout Troop 199 and Girl Scout Troop 305 presented the colors. Officers of JACL’s Central California District Council were sworn in by JACL National President David Kawamoto. The benediction was given by Rev. Akiko Miyake-Stoner of United Japanese Christian Church. Special thanks went to the major sponsors: Clovis Veterans Memorial District, VFW Sierra Nisei Post 8499, Nisei Farmers League; Sun-Maid Growers of California, Pacific Gas & Electric, Wells Fargo Bank, and Dale and Debbie Ikeda.